Filled 12 22-ounce bottles and one 11 to 140-ounce swingtop. The beer cleared up quite a bit, leaving behind a half-inch of mostly hop sediment. 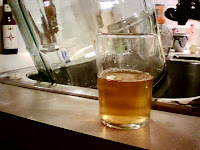 Tasted from the bottling bucket, this batch was a pretty clear gold, almost straw color. Brewing a partial mash and full wort boil must've kept the color light. The finish doesn't seem as bitter and there is more a tart character to the beer (in the middle, not really in the finish). Very smooth and slightly viscous up front, but finishing very dry. I've very happy with this fermentation. Since racking to the secondary the beer has dropped an additional 10 points after fermenting from 1.053 to 1.016! If all goes well, this should be a very tasty dry ale after three months or so, say July or August. A recent issue of Zymurgy magazine featured a cover story "A Saison for Every Season" and I can definitely see doing that. I'm thinking that the batch I just bottled would be my summer batch and that I'd brew an autumn batch in June. Hopefully I'll still be able to get my hands on some on the Wyeast 3724 or White Labs 565 Saison yeast. That said, I'd like to be squeeze in a three gallon batch of witbier in the next couple weeks. Meanwhile, my three-gallon batch of Saison continues to sit in the secondary. I may take a reading sometime this week, if the hops ever decide to settle. Two fermenters going....maybe a third? I have two beers fermenting right now. One is the three-gallon saison, which is in a carboy (secondary) with dry hops and the dregs of one 750-ml bottle of Saison DuPont. The other beer that is fermenting is a simple extract hoppy "American-style" wheat beer. It's just one four-pound can of Alexander's Wheat Malt Extract and some Amarillo hops, fermented with SafAle US-05. I tasted it the other day (after five days fermentation) and it was rather bitter with not as much late hop flavor than I wanted, but dry hopping should fix that. The beer wasn't ready to packaged yet (the gravity was a few points too high) so I'm occasionally rousing the fermenter (once every couple days) to see if gets any drier. Meanwhile, I'm still enjoying red ale from the Party Pig. The wheat beer will be packaged in my other Party Pig and maybe a couple bottes, while the Saison will be bottled in 22s. Part of me wants to get a third fermenter going with another beer while the weather is still cool (I have another carboy and the wheat beer should be ready to package later this week).